Eric Tindill was one of seven players to have represented New Zealand at both rugby and cricket (the others are Bill Carson, George Dickinson, Brian McKechnie, Charlie Oliver, "Curly" Page and Jeff Wilson) and the only one to have appeared in Test matches in both. 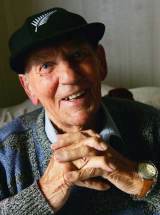 Tindill also refereed rugby and cricket Tests - he was an umpire in the Christchurch cricket Test against England in 1958-59, almost a decade after he had refereed the All Blacks against the British & Irish Lions. Tindill won five caps for New Zealand in cricket, but his only appearance in an All Black jersey came against England at Twickenham in 1936. His debut was overshadowed by that of England wing Alexander Obolensky, who scored two famous tries in a 13-0 win for the home side. He died in August 2010.